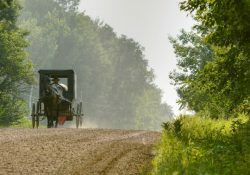 Amish in Wood County, WI have agreed to add amber lights to their buggies to improve visibility. Wood County officials previously considered an ordinance requiring seat belts, child car seats, and other enhancements, along with drivers needing to get licenses and insurance. This met with strong public opposition, from non-Amish residents in particular. Act 228 went into effect on April 3rd and calls for all buggies operating on public roadways at night or in inclement weather to have a front-facing white light (headlight) and two rear-facing amber strobe lights. It also calls for red lights to be mounted in a way that shows the width of the vehicle. The initial attempts of the officials to address buggy safety drew a lot of pushback. It turns out in this case Amish are complying with the milder requirements. It is not always, or even often, the case that Amish make changes like this in response to external forces. This group clearly sees the changes as acceptable. Maybe some in the community even wanted to see these additions, but there needed to be a reason to move ahead with them, provided in this case by the new law. Act 228 is a statewide statute. I have not seen much reporting on how other Wisconsin communities have been affected. Do local jurisdictions have some latitude as to enforcement? You can read the text of Act 228 here. Wisconsin has over 50 Amish communities. — some families will now up and leave for a no-lights-on-buggies settlement, I bet. Ouch. I would think so too, but by the sound of this story, it’s suggested that the community is accepting or even embracing the change. But yes in most communities of size, there is a contingent that might not like the change and may even be motivated to take life-changing action. Maybe the Amish here found lighting easier to accept since the other side initially took such an extreme position (the whole seatbelts, insurance, etc. proposition last fall). I like that the Amish themselves feel safer with the lights. Seatbelts and child seats sound extreme to me. What next, seatbelts for horse riders? School busses need seatbelts but no one, in Florida, wants them because of the cost to tax payers. IIRC from the comments on the previous seatbelt post, it was suggested that being strapped in by seatbelt to a horse-drawn vehicle may even be more dangerous than being thrown from the vehicle. I would agree with that. If the horse bolts or shies, you’re better off being able to move quickly. Even if a buggy should flip over, you want to move out of hoof-reach FAST. This will go a long way to keep these people much safer. I’m really glad. It makes me so sick to think about all those poor vulnerable folks on the road. Do you know what affiliation the Wood Co. Amish are part of? I wonder what the several Swartzentruber districts in Wisconsin will do regarding compliance with this Act 228. I also think there is at least one district of the Kenton, Ohio affiliation in Wisconsin and that affiliation does not approve of buggy lighting as far as I know.